Ostrava, Czech Republic, 26 August 2018. Download our free reports in Czech, English, Greek, Italian and Slovenian. The EU funded Elevator Project, has run for 3 years and is now coming to an end. A key driver for the project was recognising that for people with disabilities to be able to participate in tourism, the tourism sector must have a good understanding of this growing market. In addition, the performance of well-trained professionals is fundamental when serving people with access requirements. Accessibility is not only about physical access to the buildings; a truly accessible tourism product minimises or removes physical, attitudinal, information, financial and other barriers. The name of the project "Elevator“ represents the effort to raise the quality of human resources and services in tourism to a higher, more competitive level. The ELEVATOR project has therefore placed a focus on adult education and business development (business competencies) in the field of accessible tourism for all. Our research has established that there is still a huge lack of knowledge amongst tourism industry professionals about customers with access requirements. How best to welcome them? How to organise a visit so that they can participate on an equal footing with other tourists? How can professionals educate themselves in this field? The aim of the ELEVATOR project has therefore been to address this lack of knowledge by exchanging good practices in adult education for accessible tourism as well as developing and disseminating appropriate innovative intellectual outputs, to address the lack of knowledge outlined above and aimed at a number of different target groups (see below). The potential longer term benefits are: better quality, efficiency and relevance of education for accessible tourism; higher attractiveness and interest in education for accessible tourism among training/education and tourism services providers; better access to education in accessible tourism for individual learners, professional development of tourist/travel guides; more accessible tourist destinations and facilities, extended tourism offer and higher involvement of disabled people and seniors in travelling. SMEs providing tourism services and related support. Project reports are free of charge and can be downloaded from the project website. English, Czech, Greek, Italian and Slovenian. • Project Flyer – gives an outline of the project aims and objectives. • Training – a report on Accessible Tourism Training provides an analysis of Accessible Tourism training practices based on surveys carried out in the project partners’ countries and information from other European studies and experiences. • Tourist Guiding – a Handbook on Inclusive Tourist Guiding provides learning material focused on guiding tourists with specific access requirements. Its creation was initiated by professional tourist guides, who meet tourists with access needs more and more often in their work, as their number is growing mainly due to the ageing population. 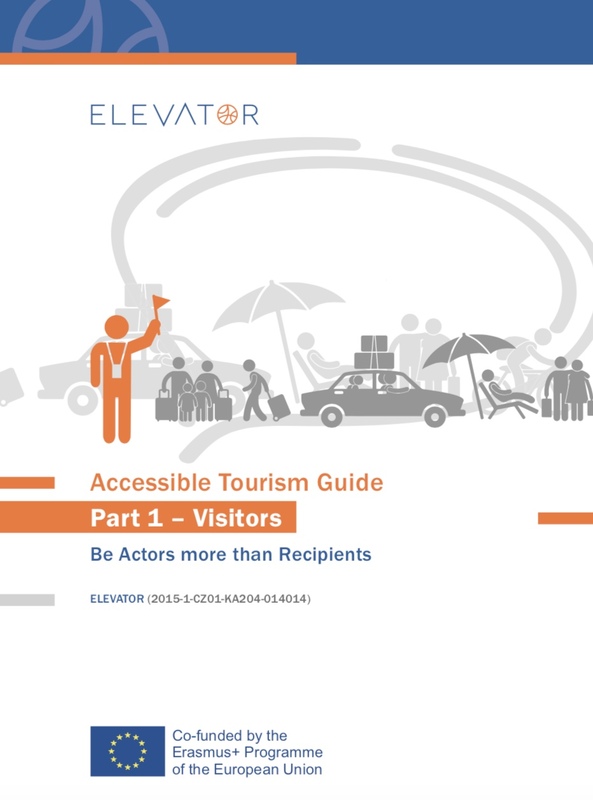 • Visitors Guide - This chapter, “Be Actors more than Recipients” is dedicated to Visitors, i.e. all users of tourism infrastructures and services including residents, who could have more courage and be more pro-active in demanding accessible environments, products and services. • Industry Guide - This chapter, “Be a level above rather than just a step ahead“, focuses on Businesses in the Tourism Industry, i.e. tourism service providers, giving guidance on how to meet the accessible market demand and make their business more competitive and sustainable. • Policy Makers Guide - This chapter “Lift upward not only push ahead“ is aimed at Policy Makers, i.e. politicians, public authorities, tourism boards and other decision makers in tourism and access policies on national, regional or local levels, who are expected to take into account citizens' needs and create a suitable environment for cooperation and motivation of all stakeholders in order to lift up the tourism offer and environment for living. Throughout the project, five Newsletters were produced providing progress updates. More information can found at the Elevator project website.